If you live on your own, and can't be bothered to cook a proper meal for yourself, give this method a try. Why, you might ask, cook a chicken breast in a sandwich press? Well, let's talk first about chicken breasts. They are quite expensive, I grant you that, but they are also a fabulous low-fat protein source for children and teenagers. And, besides, kids like them: almost every child I know - bar the very pickiest of eaters - will happily munch on tender, juicy, well-seasoned slices of chicken breast. 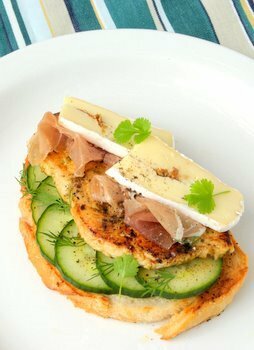 My teens are really enjoying these quick-cooked breasts on open sandwiches layered with crunchy ingredients (the picture above includes cucumber, dill, Parma Ham and a lovely mushroom-filled brie), or eaten as-is, in piping-hot strips, with a dollop of home-made mayonnaise. 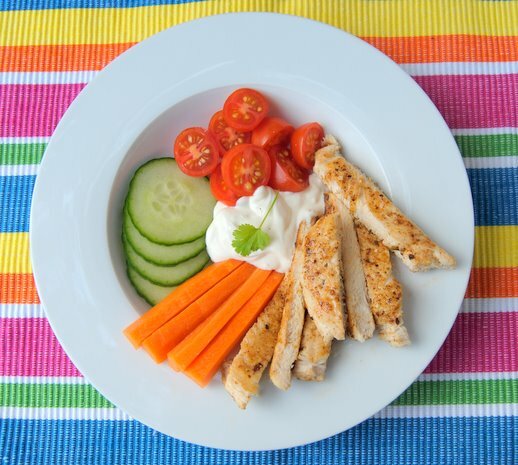 And here's how to serve chicken-breast strips for toddlers and under-tens: hot, with crunchy fresh vegetables and big dollop of what I call Yoghurnnaise. This is a mixture that I make three or four times a week, and that my kids love: two-thirds natural yoghurt to one-third good mayonnaise (home made, or Hellman's), with a spritz of lemon juice, a whisper of garlic and some salt and pepper. Cooking chicken breasts this way is also so quick and convenient. First, the breast is done in half the normal time, because it's cooked simultaneously on both sides. Second, there is no tedious washing up of a frying or grill pan involved: all you need do is wipe down the non-stick surfaces of the sandwich press. Third, this is a tummy-filler that even a five-year-old child can make on his or her own, with little risk of burning, or setting clothes on fire, or getting an eyeful of spitting-hot fat. And last, most new sandwich presses heat very quickly, so this is a good way of saving energy. You can cook these chicken breasts as they are, but they are better when well seasoned. I buy eight or ten chicken breasts at a time, flatten them (see below) and then toss them in a little lemon juice and olive oil, with a few fresh herbs and spices added to the mix. I store them in a lidded plastic container in the fridge, and the kids help themselves - and cook the breasts on their own - whenever they're hungry. A tablespoon or two of natural yoghurt added to the marinating mixture helps to tenderise the breasts, but don't add too much, or the breasts will turn to mush after a day or two. You can use any of your favourite flavourings for the marinade - basil pesto, some lemon zest, commercial spice rubs, chilli flakes, mustard, and so on - but don't add any extra salt, which will make the breasts 'weep' in the fridge. If you've marinated the breasts, be sure to pat them quite dry with a piece of kitchen paper before you cook them. Uncooked chicken breasts soaked in a slightly acidic marinade keep well in the fridge for up to four days, but should not be stored for longer than that. Flattened chicken breasts take exactly two and a half minutes to cook in my sandwich press, but you might need to experiment with yours to find the optimum cooking time. Heat your sandwich press for five minutes. In the meantime, place the chicken breast between two sheets of clingfilm or baking paper. Using a rolling pin or a heavy frying pan, gently and evenly 'bash' the thick end of the chicken breast to flatten it to the same thickness as its narrow end. The breast will spread out a bit as you flatten it. Season the breast with a sprinkle of salt and pepper, and any other flavourings you fancy. Rub a small knob of butter or a dash of olive oil on the bottom surface of the hot sandwich press, then close the press briefly to coat its upper side with fat. Place the chicken breast on the lower surface and close the press. Cook for two to three minutes, or until they are just done, and there is no sign of pinkness when you cut a small slash through the breast. Remove from the heat and allow to rest for a minute. Slice into 'fingers' if you're feeding a child or toddler. If you're feeding yourself, put a thick slice of bread into the hot sandwich press and toast it for a minute or so. Top with some lovely crunchy ingredients, and eat piping hot. Oh no, the secret's out. I have been doing this for quite some time, thinking I could never tell anyone.....Must say your sandwich looks amazing Jane, your kids are too lucky to have you as a mom!! Such beautiful photos Jane! I love this idea - chicken salad just became a whole lot easier! Did a search whether I could grill chicken in sandwich press glad that you can. will be doing this tonight. It's also good for those dieting and upping their protein. Cant wait to try it. Now why don't we have a sandwich press?! This is what I wold use it for. Chicken breasts are the one please-all dish in our family.